MSU1 – byuu came up with the 21fx specification, later renamed to MSU1, that allows streaming of up to 4GB of data and CD-quality audio playback from mass storage. The present hardware would not have been able to stream data from card at the rate required by the spec. 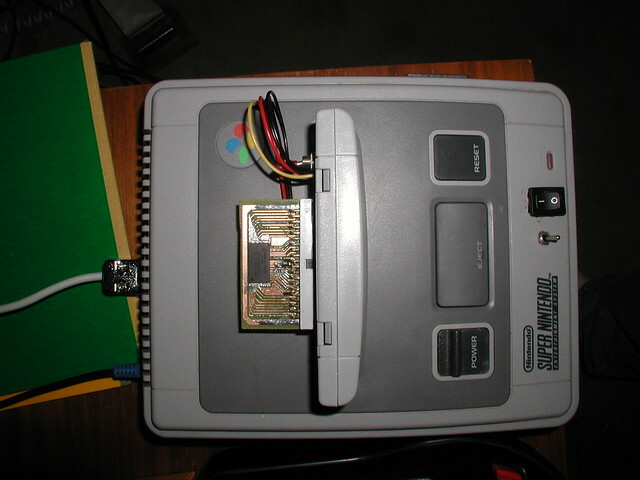 Also a DAC was needed to input audio to the SNES’s cartridge slot. 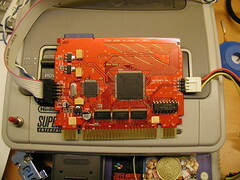 Additionally the bonus extension pins of the cartridge had to be added again to accomplish this – to access the line-in and to synchronise audio with the SNES master clock to maintain A/V sync during video playback. RAM cost and space requirement. The 64 MBits of SRAM were comprised of four 16 Mbit SRAM chips at ~14€ each. A 128Mbit PSRAM is now used. There was a catch though – these chips are only available in BGA packages. 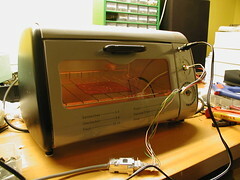 A subproject was initiated to modify a pizza oven to work as a makeshift reflow oven. I was skeptical at first but it proved to work better than expected. A second RAM bus was added. This was necessary to allow for parallel access to the ROM and battery/cartridge RAM areas. Some custom chips like the SuperFX require this. The second RAM is 4Mbits of SRAM. 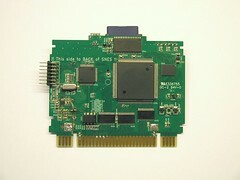 The increased number of required I/Os required changing the FPGA to a bigger package (PQ208). Due to MSU1 the loading speed had to be improved. A more advanced microcontroller (ARM Cortex M3 @100MHz) was used to replace the slow 8-bit AVR. This chip also includes an RTC so a battery holder was added to maintain the RTC. The battery doubles as a backup battery for the 4Mbits of SRAM. That way saved games can be preserved even when a blackout occurs before the automatic save feature can write to SD card. I replaced Eagle with KiCAD as the EDA tool – it is free as in speech, less restricted, and slightly more usable. 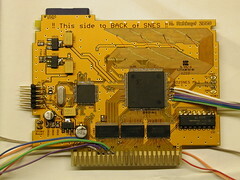 Development of sd2snes began in April 2009, inspired by sd2iec (hence the name). Even back then the idea to make a complete flash based cartridge from scratch was lingering in the back of my head. But it seemed too difficult to do for me. It also seemed impossible to implement new features, like additional memory maps, custom chips, etc. afterwards with the flexibility I wanted. Fast forward to 2009. With time, more powerful yet affordable FPGAs had become readily available. Also sd2iec was released which provided ready-made SD card support (SPI mode). The first prototype was constructed on breadboard with lots of self made adapters, most notably the FPGA->breadboard adapter, with on board power supply and configuration jumpers. This design was more or less adapted for the first PCB prototypes (all of Mk.I), the only difference being more SRAM (64MBits). Loading was somewhat slow due to SPI mode and a maximum 6MHz SPI clock from the AVR. Later the FPGA was used to load blocks to RAM directly, increasing the read speed to ~1.5MB/s. 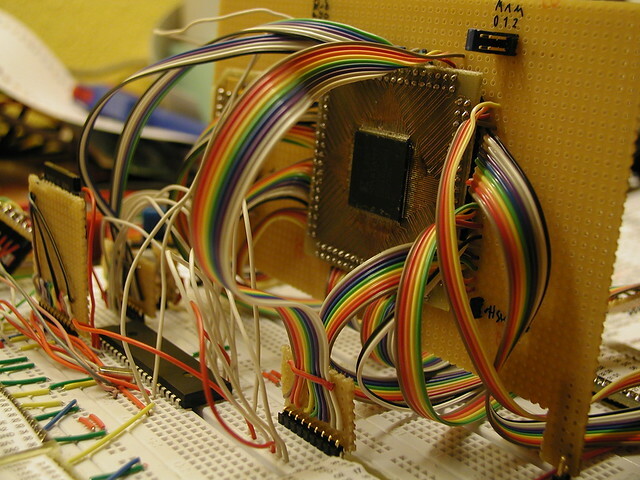 SNES master clock (Pin 1) was used as a clock source for the FPGA. It proved unreliable (the DCM just stopped working at random) so in later revisions (and all of Mk.II) the AVR clock output was used to clock the FPGA. This resulted in the last revision of Mk.I having the additional groups of slot pins removed entirely.